TR2 was produced from 1953-55 with 8,628 being built. TR3 was produced from 1955-57 with 13,377 being built. TR3a was produced from 1957-61 with 58,236 being built. TR3b was produced in 1962 with 3,331 being built. TR4 was produced from 1961-65 with 40,253 being built. TR4a was produced from 1965-67 with 28,465 being built. TR5 was produced from 1967-68 with 2,947 being built. TR250 (the TR5 for the N. Amer. market) from 1967-68 with 8,494 being built. TR6 was produced from 1968-76 with 94,619 being built. 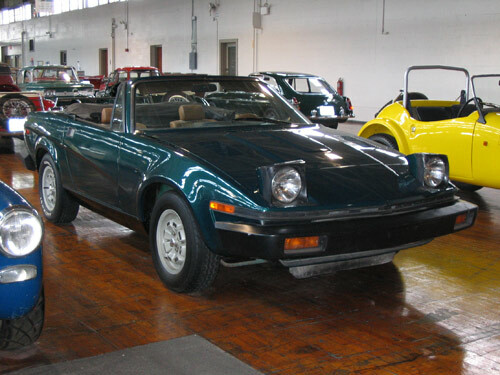 TR7 was produced from 1974-81 with 112,368 being built. The TR7 was a controversial car; it introduced us to the wedge-shaped body seen in the TR8. The TR8 was produced for export only, although 18 right hand drive were built for the British market as a coupe or convertible, convertibles being more common. This is the last model Triumph produced. Manufacturer: British Leyland Ltd.; BL Cars Ltd.